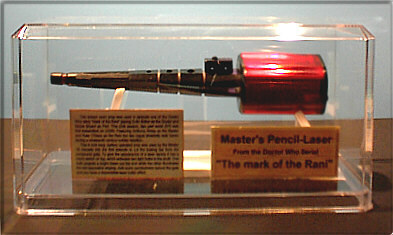 This screen seen prop was used in episode one of the Doctor Who story "Mark of the Rani" staring Colin Baker as the Doctor and Nicola Bryant as Peri. This 22th season, two part serial (6X) was first transmitted on 2/2/85. Featuring Anthony Ainley as the Master and Kate O'Mara as the Rani the two rogue timelords reek havoc during a nineteenth century luddite rebellion. 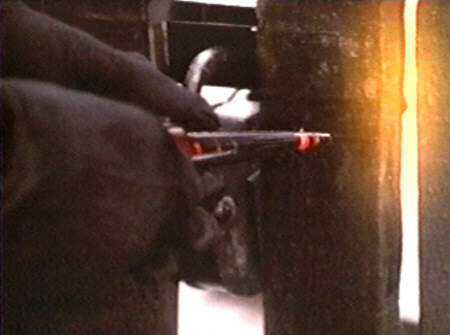 This 8 inch long, battery operated prop was used by the Master 18 minuets into the first episode to cut the locking bar from the compound gate. To give the appearance of a laser device it has a micro switch on top, which activates two light bulbs in the shaft. One bulb projects a bright beam out the end while the other illuminates the red decorative striping. Add some pyrotechnics behind the gate and you have a respectable laser cutter effect. 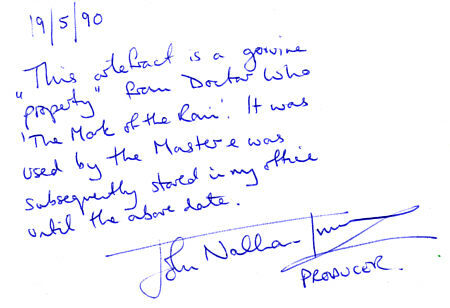 After shooting "The Mark of the Rani" in 1984 the laser found it's way into John Nathan-Turner's office. Living there for the next six years as a display piece. In May 1990, JNT donated the laser to a fund raising auction conducted by a small convention in London. The convention was organized by noted collector Mark Short and in addition to JNT was attended by Colin Baker and Nicola Bryant. After some active bidding at the auction the laser went to Steve, a private collector in London. The second bidder, Tim P. from Essex, almost immediately regretted not bidding more. A week after the auction was over, Tim tracked down Steve and bought the laser from him. I bought the laser from Tim on the 15th of May 2001 and it now resides in my collection located in Virginia, USA.